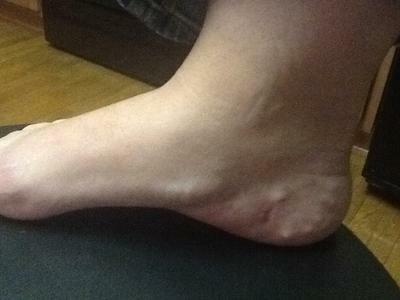 it tingles, it aches, it spasms, it loses feeling at times, and the pain can be in the heel all the way up to through the arch and up to the inside of the ankle bone. I'm wondering if I had something else going on before the surgery or if this is a complication from the surgery since tapping on or near the incision gives me that tingling feeling. Also, at this point I am unsure of the best course of action. I am a 43 year old mother of 4 children. I am getting more and more concerned about my future. The best piece of advise I could give you would be to get a second opinion immediately. Based on your narrative it sounds like the doctors in this group are just "guessing" at this point. You do not mention it, but I am wondering if you had an MRI prior to surgery. There are just too many conditions that cause heel pain and when it gets to the point of considering surgery, as far as I am concerned an MRI is mandatory to rule out things like a plantarfascial tear, heel fracture, or even a tumor in the heel bone (a remote possibility). Additionally tarsal tunnel syndrome can cause heel pain as well as a heel neuroma, neither of which would have been resolved with the type of surgery you had. I am assuming you had the Topaz coblation on the bottom of the heel and so the small scar on the inside of your heel would suggest to me that you had an endoscopic plantarfasciotomy. Now the fact that you cannot move your pinky toe outward, lack of feeling in part of the foot, the burning, tingling sensation you are getting is all nerve type problems. It could be a worsening of a tarsal tunnel, if that is what you actually have, or it could be nerve damage from the surgery. Since you state when you tap on the incision and get a tingling sensation, that is very suggestive of a heel neuroma. Complicating all the possibilities is the fact that you had surgery on the heel. Four months post op, I would not expect you to be doing cartwheels but I would have expected you to be getting better and better on a weekly basis; clearly you are not. You need someone to isolate exactly what your problem is possibly through nerve conduction studies and an MRI and then it will be easier to proceed in a manner that will improve your situation. You cannot continue to have people keep guessing what is going on. 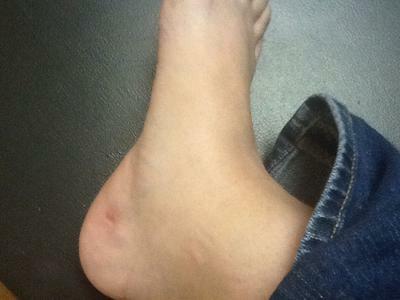 I had in step plantar fasciotomy exactly one week ago. When the doctor went to give me the nerve block shot she literally hit the nerve with the needle...my foot went flying and it felt like a GIANT electrical shock. Surgery went ok I think...but the following day I was in EXTREME pain. I wasn't able to walk on my heel as I was told and I literally had to crawl during those 24 hours. After that, the pain eased up. 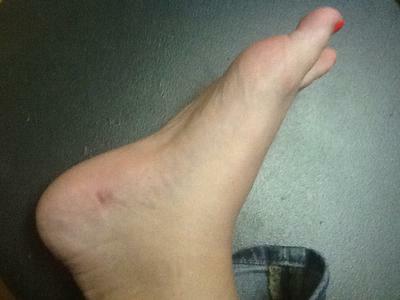 However today my foot feels strange. My toes feel tingly and my foot and calf are physically cold, much colder than my other leg. Did something happen when she hit that nerve? I had a follow 3 days ago and she said that it was possible my extreme pain for the one day had been caused by hitting the nerve but she wasn't sure and that pain like that wasn't common with this surgery. She also said she was just guessing since she had never actually hit a nerve before....I am not sure if any of this is a complication, if its normal for this surgery, etc...but my calf, foot and toes are almost freezing to the touch. The color is good but I am beginning to become worried. The fact that your foot and lower leg is cold is not a normal sign. I would suggest that you call your doctor and insist that she take a look at your foot. You are correct, Hi this is Dee from previous post 2016, Received second opinion and also had a 3T MRI which can see the small nerves in the foot. The second Dr. would say I had lateral nerve damage, I asked him how did this happen? was it from the surgery...lol He said he couldn't tell me that, even though I had none of this before the plantar fasciitis surgery, this began 2 days after my original surgery. I saw two other Dr's both said they didn't know how this could happen, I feel everyone covering for each other. I went to a famous hospital to see if a decompression would help with the pain. had surgery, tarsul tunnel release and decompression. 5 months later no change, still in excruciating pain. I went back to the second opinion Dr and he advised if the decompression surgery didn't help any, all he can tell me is that I am disabled now and I have permanent nerve damage to my foot. But still won't say it came from the original surgery. I tried to speak with a attorney. My life has been ruined and turned upside down, lost my job and unable to walk on the foot, or stand for more than 10 steps without being in excruciating pain, have not worn a shoe in over a year taking nothing but pain management meds. the second opinion dr said he can't help me anymore, no need for me to come back. I in a way understand he can't help me, but won't be honest and say it came from the first surgery, I have been without pay for over 1 year, no ltd , std, disability nothing, lost everything, loosing my home, no attorney will take the case, because they say no dr will say what it came from. I can't believe this Dr. was able to do this to me and I am using a cane and a rollator walker and I can't make him be accountable for what he has done and the dr's and attorneys are saying nothing can be done. I am just left disabled, disability won't approve because when they get dr's notes, the first dr never provided the notes where I have proof that I mentioned 2 days after the surgery and continued to mention to him the excruciating pain and all he did was push percocets, unbelievable, so no long term disability or ss disability, just loosing everything, depressed and going down. Thank you for your reply, it was the right thing to do even though that didn't work. Hello I am reading the comments and I too am having the same problem October of 2015 I had plantar fasciitis surgery a week after the surgery I kept telling the doctor that I had a new pain and something else was going on I cannot put my foot under the sheets at night it has a excruciating pain for anything to touch my toes I have a lot of burning, tingling, numbness. Can't walk on my foot he kept saying all its just from the surgery two weeks later told him the same thing something else is going on this is a totally different type of a pain in a different area. he kept wanting to pump me up on percocets percocet percocet 9 weeks after the surgery I told him I think we need to have an MRI done because what I am feeling has nothing at all to do with the plantar fasciitis now I have a plantar plate tear and I have my regular doctor scheduling me for a EMG to get my nerves tested in my foot and toes. I don't understand why this doctor wouldn't listen to me and perform the MRI sooner and then he could have known what else was going on with my foot. I want to know did he cause this from his surgery. Did he pull my foot back too far or stretched something. In the meantime I cannot walk right now my job fired me I'm supposed to get long term disability through Cigna they are harassing me won't pay lying about everything. Making life so difficult so I'm having to go through more testing and see what I need to try and do next. I had asked the dr before I had my surgery. When I had the surgery will I be able to move my toes he's so yeah no problem we're not doing nothing with that here we are 10 weeks later I cannot move my toes. That is not a side effect of the surgery. Your best bet would be to get a second opinion from another doctor who specializes in surgery of the foot. I would also suggest that you seek the opinion from someone who does not practice in the same immediate area as your first surgeon. The second surgeon, if completely honest, should be able to answer all your questions. I too have had foot pain. I was told it was plantar fasciitis. I did multiple rounds of cortisone shots which did not help at all. I was put into a night splint which also didn't help much. We could not try inserts due to a leg discrepancy from a total hip replacement. My podiatrist suggest I have topaz debridement procedure. He claimed it was less evasive and has had a great deal of success with it. I had the procedure done in December 2014. I was told it could take upto 4 months to recover from it. With in three days post surgery when they removed the bandage, I noticed 2 red marks on the top of my foot and my big toe and the toe next to it were numb. I asked about it and was told it will go away in time. If I touch the red marks in any way I get shooting electric shocks straight to the 2 toes that are numb. My dr.s response was that he had no idea what it could be. Since then I too have gotten a second opinion and they are concerned that there is now nerve damage with the possibly of RSD. I have to see neurology and pain management and I was told I have a long road ahead of me. Iihope you have better luck than me. I would like to talk to you in more detail to see if you had any results that seem to help. I know with my situation it makes sleeping very difficult. I wake up constantly in pain.. I cannot thank you enough for your response, opinion, and suggestions! I want you to know how much it means to me, and I'm sure everyone else who has ever asked you a question! I feel like you're a lifesaver and have empowered me to take a stronger role and stand up for myself and my feet! Anyways, I never had an MRI before or after surgery. You were right that the topaz coblation was on the bottom of my foot and that the small scar was from the endoscopic plantar fasciotomy. The new doctor that I saw on Thursday kind of reminded me of a politician. He'd agree with my questions and frustrations but then after minutes of talking would never actually answer my question. When I asked him about the MRI and nerve conduction study, he said he was all for testing but that there were a lot of false results from a nerve conduction study and that he was basically positive that I had tarsal tunnel syndrome. He gave me a cortisone injection above the nerve and wants me back in two weeks. Yesterday I called the office and said that I had talked to him about the tests and that I really would like to get them done. They left a note for the doctor. Hopefully, it'll work out, but, if not, I will try with my old doctor or try a new one. Again, thank you so, so much!